In comparison the Airbus A380-800 has a length of 73 metres (240 feet), wingspan of 79.75 metres (261.6 feet) and a height of 24.1 metre (79 feet. 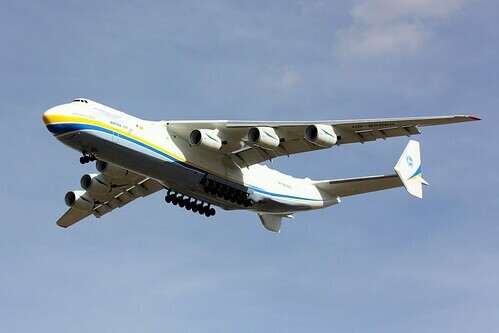 However Airbus A380-800 is a passenger plane where as AN-225 is a cargo plane. 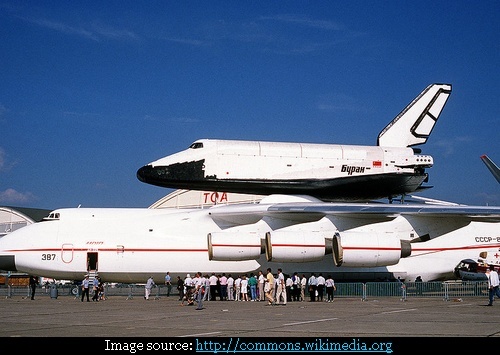 It was built in 1988 as a part of Soviet space programme for carrying the heavy weighing Soviet rocket boosters and the Buran space shuttle on its upper deck. Besides being the largest, it is the only single plane of its size and type. 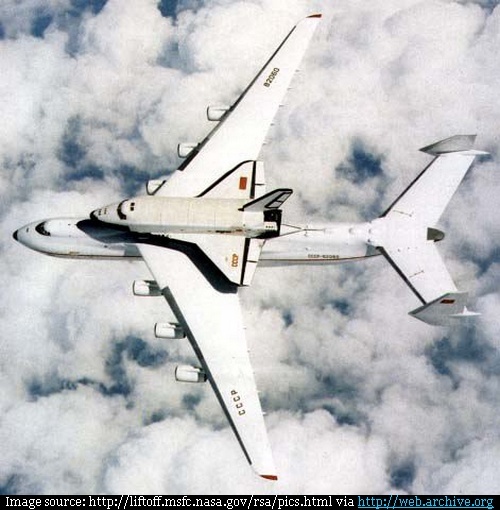 Although couple more were planned but with the disintegration of the Soviet Union and subsequent curtailment of Soviet space programme even this air craft was mothballed in 1994 but was later re-commissioned and is used now a days for carrying extra heavy loads. Besides being the largest it is also World's heaviest aircraft. It has payload capacity of 250 tonnes and can carry piggy back weights up to 200 tonnes on its upper deck roof. 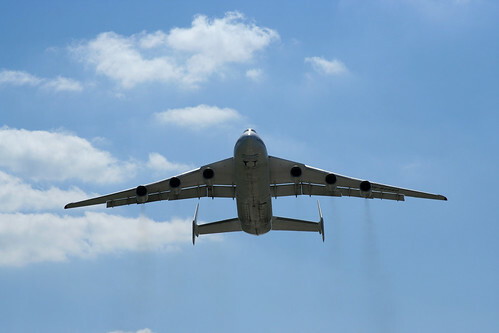 The aircraft has six engines and a 32-wheel landing gear system. On 11 August 2009 it set a record of carrying the heaviest single cargo item ever sent via air freight by transporting a generator for a gas power plant in Armenia weighing 189.09 tonnes (416,900 lb). Image copied from Wikimedia Commons is in public domain. Source of Image: This image is widely available on the internet and is presumably under public domain. The image used in this blog has been obtained via Internet Archive (http://web.archive.org) as it couldn't be located in the present web site of NASA - http://liftoff.msfc.nasa.gov/rsa/pics.html. The aircraft is based at Hostomel Airport (aka Antonov Airport), Kiev, Ukraine and can be seen in Google Earth/Maps. Credits: Braham_S_Aggarwal, member Google Earth Community Forum who was first to spot it in Google Earth. His post entitled 'The Biggest Airplane in the World' brought this big bird to my knowledge. Thank you Braham.